Style of Hellenistic Greek Sculpture. Agrios being bludgeoned to death.  Who Were the Attalids? see the Art of Classical Antiquity (c.1000 BCE - 450 CE). his wife. National Museum of Rome. victory over the Gauls (220 BCE). In Greek art, the term "Pergamene School" describes a type of Greek sculpture associated with the city of Pergamon in Asia Minor, during its golden age when it was ruled by the Attalid dynasty (241-133 BCE). Like Hellenistic art in general, the Pergamene style of sculpture was marked by a high degree of emotion as well as a pronounced naturalism, which helped to create a vivid sense of reality in the spectator. Examples of Hellenistic Greek sculpture created at Pergamene, include: a series of statues of Dying Gauls (the most famous examples of which are in the Capitoline Museum and the National Museum, Rome) that experts have identified as copies of works commissioned by Attalus I (reigned 241-197 BCE) to celebrate his victory over the Gauls; and the action-packed relief sculpture of the Pergamon Altar of Zeus, built by King Eumenes II of the Attalid dynasty, during the period 166 to 156 BCE. Only a small number of names of sculptors belonging to the Pergamene school are known to us: they include Antigonus, Epigonus, Phyromachus, Sogonus and Stratonicus. Other Hellenistic statues and reliefs such as Laocoon (42-20 BCE), Menelaos with the Body of Patroklos (3rd Century) and The Punishment of Dirce ("Farnese Bull") (2nd Century BCE), are also characterized by a similar sense of drama and action, leading some art historians to question the need for a separate "Pergamene" style. However others, including the scholar T.B.L. Webster, insist that the plastic art created for the Attalid court at Pergamon manifests a unity of style which fully justifies the name Pergamene. 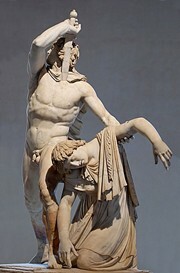 NOTE: For later sculptors and movements inspired by the Pergamene School, please see: Classicism in Art (800 onwards). Pergamon (sometimes called Pergamum) was an ancient Greek city (think of it as a Greek colony) located on a hill overlooking the Caicus River in present-day Turkey. It stood inland, some sixteen miles from the shores of the Aegean. Pergamon was founded around the mid-point of Classical Antiquity, during the 5th century BCE, although it only came to real prominence when it served as the headquarters of the Attalid dynasty (241-133 BCE). Today, its site is occupied by the Turkish town of Bergama. Following the death of Alexander the Great in 323 BCE, his sprawling kingdom was fought over by and eventually divided between his strongest generals, known as the "Diadochi" (successors), each of whom established separate dynasties. The four power blocks to emerge, were: Egypt, ruled by the Ptolemy dynasty; Mesopotamia and Central Asia, ruled by the Seleucid dynasty; Macedonia, ruled by the Antigonids; and Asia Minor (also called Anatolia, modern-day Turkey) under the Attalid dynasty. Although initially a vassal state of the Seleucid kingdom, the Attalid kingdom gained its independence under Eumenes I, and by 183 it had expanded to include most of Asia Minor, partly due to its alliance with Rome. The Attalid fortress and palace were built on the top of the hill at Pergamon, while the rest of the city occupied the lower slopes and the plain. In 133, after Attalus III died without an heir, the kingdom came under the control of the Roman Republic. "Hellenism" is the name given to the general admiration for the art and culture of classical Greek civilization, which flourished around the known world from the death of Alexander in 323, to the decline of Greek power in 31 BCE. Peoples around the Eastern Mediterranean, for example, were enormously impressed by the sculpture of ancient Greece, as well as Greek architecture and Greek pottery, all of which were widely imitated. The Attalids turned Pergamon into one of the most beautiful Greek cities of the Hellenistic period. A library was built which was second only to that of Alexandria; several theatres; a temple to Athena Nicephorus; and of course the Great Altar of Zeus with its extraordinary frieze of stone sculpture. In addition, hundreds of sculptures and paintings were commissioned to decorate the city's temples and public spaces. By the time of its amalgamation by Rome, this magnificent architectural complex (much of which was completed by Eumenes II and Attalus III) was home to almost 200,000 people. After the fall of Rome in the 5th century CE, Pergamon became part of the Byzantine Empire until it fell into Ottoman hands during the 14th century. The style of sculpture championed by Pergamene artists - sometimes referred to as Pergamene Baroque - is best seen as the leading edge of Hellenistic marble sculpture, during the period 200-150 BCE. It is characterized above all by highly expressive gestures, dramatic action-filled poses, exaggerated musculature and deep drapery folds, all of which helps to convey the pain, anguish and other emotions of its subjects. These characteristics are exemplified in a votive group of statues commissioned by Attalus I (269-197 BCE), to celebrate his victory over the Gauls. Consecrated on the Acropolis of Pergamon, this group includes the famous staue of a Gaul killing himself and his wife (original now lost, but an excellent copy can be seen in the Massimo alle Terme Museum in Rome). These and other similar Pergamene statues were later copied by Roman sculptors and are known as "Dying Gauls". 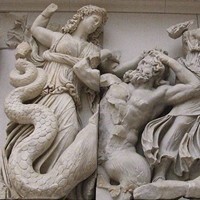 The Pergamene Baroque style is especially evident in the Great Altar of Zeus, with its 370-foot long marble frieze depicting the Gigantomachy from Greek mythology. This 9-foot high tableau of reliefs is alive with figures of gods and giants locked in mortal combat. On the surface, these images may depict the mythical victory of Zeus over the Giants, but on a deeper level it depicts the Pergamene victories over the Celts and other invaders from the east. Indeed, some scholars believe it equates Pergamene triumphs with those of 5th century Athens. In addition, Pergamene sculptors were at the forefront of attempts to rework High Classical Greek sculpture, a task exemplified by the colossal 3-metre high Athena, which reinterprets the Athena Parthenos - the Goddess of Athena, sculpted for the Greek Parthenon by Phidias (488-431 BCE). This Pergamene classicism is marked by a focus on creating works that can be appreciated from all angles, as well as a new suppleness of posture. Note: The Great Altar of Zeus, along with other free-standing sculptures on the acropolis of Pergamon, were excavated in 1878 by the distinguished German archeologists Carl Humann (1839-96) and A.C.L. Conze (1831-1914), under the auspices of the Prussian State Museum of Culture in Berlin. The sculptures recovered, including all that remains of the compelling Gigantomachy frieze, are now on display at the Pergamon Museum, Berlin. For more about Greek arts and crafts, see the following articles. Palatial architecture, murals and sculpture. Arts and crafts from the Greek islands and colonies in the Aegean. Reliefs, pedimental sculpture, bronze statues. Apollo Belvedere, Aphrodite of Knidos, and other masterpieces.  For more about Pergamene arts and crafts, see: Homepage.